GULF OF THAILAND - Amphibious assault ship USS Bonhomme Richard (LHD 6) and the 31st Marine Expeditionary Unit (MEU) worked together to conduct a non-combatant evacuation operation (NEO) and transportation of Japanese nationals overseas (TJNO) exercise off the coast of Sattahip, Thailand, Feb. 17. These emergency evacuation demonstrations, which also included participation by Thailand, Japan, Indonesia and Malaysia, are held to practice the ability of participating militaries to assist in the evacuation of noncombatants, nonessential military personnel, selected host-nation citizens, and third country nationals from a foreign nation to an appropriate refuge in time of emergency. Conducted as part of exercise Cobra Gold 2013, the emergency evacuation simulation exercised the ability of the Bonhomme Richard Amphibious Ready Group (ARG) and 31st MEU to quickly evacuate civilians during a time of crisis. The emergency evacuation process began on shore, where more than 50 personnel played the role of civilian evacuees. Here, the mock evacuees were organized, informed of the evacuation process and thoroughly searched before being medically screened for illness, injury or special needs. Evacuees then filled out tracking and safety documents before boarding helicopters for evacuation to Bonhomme Richard. During the exercise, Bonhomme Richard Sailors and 31st MEU Marines landed in a simulated potentially hostile area, in order to secure and evacuate personnel participating in the exercise. "This NEO exercise was an enormous undertaking, but it went very smoothly," said Marine Capt. Karl Fisher, squadron pilot and 31st MEU flight line officer. "Hundreds of U.S. Sailors and Marines processed and transported more than 50 mock evacuees to where they needed to be. We utilized helicopters assigned to Marine Medium Helicopter Squadron (HMM) 262 and hit our timelines right on the dot." Throughout the exercise, Sailors from Bonhomme Richard's operations department stood by to identify the evacuees and assist in tracking the progress of the operation. These Sailors also monitored the situation ashore to assist in locating potentially missing evacuees or update security information for ground forces. Once the evacuees were safely aboard the ship, they were escorted through a security checkpoint and then guided to the hangar bay, where they were entered into a tracking program. 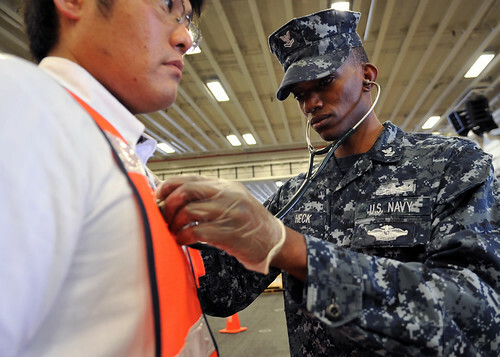 After the evacuees were processed, they received simulated medical care if needed, and then assigned to one of the ship's berthing areas to relax and refresh while awaiting repatriation. Exercise events like the emergency evacuation demonstration provide the opportunity for a joint and multinational force to develop interoperability and enhance the capability rapidly and effectively respond to a crisis. "It's great to know that we can help out at a moment's notice like this," said Master-at-Arms 2nd Class Travis Briggs. "NEO operations are a great opportunity for Bonhomme Richard to provide the support we are capable of and I would be glad to be a part of something that could help so many people. After participating in the drill today, I know we are ready." Capt. Daniel Dusek, Bonhomme Richard's commanding officer said he was extremely pleased with the efforts of all personnel involved in the day's events. "Today's evolution was a superb effort by the Bonhomme Richard Amphibious Ready Group (ARG) team and it was great to see the exercise come to fruition, especially given its complexity," said Dusek. "It was achieved through the hard work of the Bonhomme Richard ARG Sailors and 31st MEU Marines. No matter how hard the challenge, or how obscure the tasking, our Sailors and Marines are professionals and are always ready to answer the call."